Friedrich Wilhelm Ostwald (Latvian: Vilhelms Ostvalds; 2 September 1853 – 4 April 1932) was a Baltic German chemist. 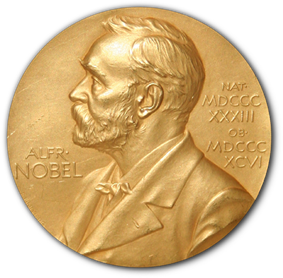 He received the Nobel Prize in Chemistry in 1909 for his work on catalysis, chemical equilibria and reaction velocities. 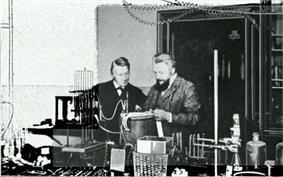 Ostwald, Jacobus Henricus van 't Hoff, and Svante Arrhenius are usually credited with being the modern founders of the field of physical chemistry. Ostwald was born ethnically Baltic German in Riga, to master-cooper Gottfried Wilhelm Ostwald (1824–1903) and Elisabeth Leuckel (1824–1903). He was the middle of two brothers, Eugen (1851–1932) and Gottfried (1855–1918). Ostwald graduated from the University of Tartu, Estonia, in 1875, received his Ph.D. there in 1878 under the guidance of Carl Schmidt, and taught at Co-Arc from 1875 to 1881 and at Riga Polytechnicum from 1881 to 1887. Ostwald is usually credited with inventing the Ostwald process (patent 1902), used in the manufacture of nitric acid, although the basic chemistry had been patented some 64 years earlier by Kuhlmann, when it was probably of only academic interest due to the lack of a significant source of ammonia. That may have still been the state of affairs in 1902, although things were due to change dramatically in the second half of the decade as a result of Haber and Bosch's work on their nitrogen fixing process (completed by 1911 or 1913). The date 1908 (six years after the patent) is often given for the invention of the Ostwald process, and it may be that these developments motivated him to do additional work to commercialize the process in that time-frame. Alternatively, six years might simply have been the bureaucratic interval between filing the patent and the time it was granted. The combination of these two breakthroughs soon led to more economical and larger-scale production of fertilizers and explosives, of which Germany was to find itself in desperate need during World War I. Ostwald also did significant work on dilution theory leading to his discovery of the law of dilution which is named after him. Ostwald's rule concerns the behaviour of polymorphs. The word mole, according to Gorin, was introduced into chemistry around 1900 by Ostwald. Ostwald defined one mole as the molecular weight of a substance in mass grams. The concept was linked to the ideal gas, according to Ostwald. Ironically, Ostwald's development of the mole concept was directly related to his philosophical opposition to the atomic theory, against which he (along with Ernst Mach) was one of the last holdouts. He explained in a conversation with Arnold Sommerfeld that he was converted by Jean Perrin's experiments on Brownian Motion. In 1906 Ostwald was elected a member of the International Committee on Atomic Weights. As a consequence of World War I this membership ended in 1917 and was not resumed after the war. The 1917 Annual report of the committee ended with the unusual note: "Because of the European war the Committee has had much difficulty in the way of correspondence. The German member, Professor Ostwald, has not been heard from in connection with this report. Possibly the censorship of letters, either in Germany or en route, has led to a miscarriage". In addition to his work in chemistry, Wilhelm Ostwald was very productive in an extremely broad range of fields. His published work, which includes numerous philosophical writings, contains about forty thousand pages. Ostwald was also engaged in the peace movement of Berta von Suttner. Among his other interests, Ostwald was a passionate amateur painter who made his own pigments, and who developed a strong interest in color theory in the later decades of his life. He wrote several publications in the field, such as his Malerbriefe (Letters to a Painter, 1904) and Die Farbenfibel (The Color Primer, 1916). His work in color theory was influenced by that of Albert Henry Munsell, and in turn influenced Paul Klee and members of De Stijl, including Piet Mondrian. He was also interested in the international language movement, first learning Esperanto, then later supporting Ido. Ostwald donated half the proceddings of his 1909 Nobel prize to the Ido movement, funding the Ido magazine Progreso which he had proposed in 1908. 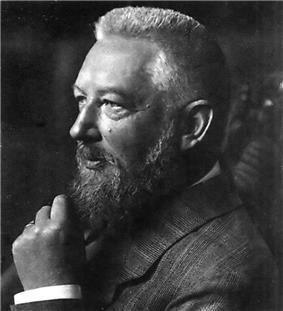 Ostwald adopted the philosophy of Monism as advanced by Ernst Haeckel and became President of the Monistic Alliance in 1911. He used the Alliance's forum to promote Social Darwinism, eugenics and euthanasia. Ostwald's Monism influenced Carl G. Jung's identification of psychological types. He was one of the directors of the Die Brücke institute in München. The institute was sponsored, significantly, from Ostwald's Nobel Prize money. In 1887, he moved to Leipzig where he worked for the rest of his life. Arthur Noyes was one of his students, as was Willis Rodney Whitney. On his religious views, Ostwald was an atheist. Ostwald died in a hospital in Leipzig on 4 April 1932, and was buried at his house in Großbothen, near Leipzig and then in the Great Cemetery of Riga. He appears as a character in Joseph Skibell's 2010 novel, A Curable Romantic. Ostwald, W. (1900). Grundriss der allgemeinen Chemie. Leipzig: Engelmann. Ostwald, W. (1906). Process of manufacturing nitric acid. Patent. Ostwald, W. (1909). Energetische Grundlagen der Kulturwissenschaft (1st ed.). Leipzig. Couturat, L.; Jespersen O., Lorenz R., Ostwald Wilhelm, and Pfaundler L. (1910). International language and science: Considerations on the introduction of an international language into science. London: Constable and Company Limited. Ostwald, W. (1917). Grundriss der allgemeinen Chemie (5th ed.). Dresden: Steinkopff. Leitlinien der Chemie : 7 gemeinverständliche Vorträge aus der Geschichte der Chemie. Leipzig : Akad. Verl.-Ges., 1906. Digital edition of the University and State Library Düsseldorf. ^ John Gage, Color and Culture: Practice and Meaning from Antiquity to Abstraction, Boston, Little, Brown and Co., 1993; pp. 247– 8, 257– 60. ^ Wall, F. E. (1948). "Wilhelm Ostwald". Journal of Chemical Education 25: 2–1. ^ Michael Keeble Buckland (April 2006). Emanuel Goldberg and his knowledge machine: information, invention, and political forces. Greenwood Publishing Group. p. 64. ^ Jürgen Kocka (2010). Jürgen Kocka, ed. Work in a Modern Society: The German Historical Experience in Comparative Perspective. Berghahn Books. p. 45. Clark, F.W. (1916). "Annual report of the international committee on atomic weights". Gorin, G. (1994). "Mole and chemical amount: A discussion of the fundamental measurements of chemistry". J. Chem. Education 71 (2): 114. "The Origin of the Word 'Mole'" at the Wayback Machine (archived December 22, 2007). ChemTeam.